Eddie Fliess… I like to call him a music factory! Every time I log into MacJams it seems there is another wonderful piece posted by EEFliess. Eddie is always on the chat window and always has a friendly hello ready. Tell us as much about yourself as you would like everyone to know. Where you were born, when, how you grew up etc. I was born in 1968 in Clifton Forge, Virginia. When I was 11 months old, my father was transferred to Ashland, Kentucky with Chesapeake and Ohio Railroad, so we lived in a little crossroads town on the Ohio River called South Point. In 1975, my father was transferred to Southfield, Michigan, so off to Michigan we went for 4 years until moving back to South Point in 1979 which was the old homestead of sorts until 2 years after my father died (1997). At that point I had been living in Columbus for about 2 years. I wasn’t born with a silver spoon in my mouth, but never really wanted for anything when I was a kid. Started playing guitar when I was 12 (doing the math….tap tap tap calculator keys…1980 right after we moved to South Point the second time). Tell us about your musical background. Did you study music, if so what and has it helped you? I told my mother I wanted to learn an instrument and drums were out of the question…well as far as she and dad were concerned, any instruments were as they had this nutty misconception that because I threw my 6th grade band trumpet across the room after only one week, I wasn’t going to stick to any other instrument…so my mother bought me a cheap old guitar for $25 to see if I’d stick with it….then my dad saw that I was sticking with it, enrolled me in the Pied Piper School of Music in Huntington, WVA in December of 1980 (was there for 5 years, went through 4 instructors, then stopped prior to graduation from high school). You mention you played in a band (or two) tell us about your experience. Did you record or was it just live work? My second venture in musical team efforts came in college. I met a couple guys, Jim Nolan and Tim Savage, who were futzing around on guitar and vocals and basically said “Lets start a band”, so we did, and Red Over Green was born. One of my pieces on MacJams (Hundred Million) is actually a derivative of two of the songs we composed. I still talk to Jim quite a bit. Tell us about your musical motivations. You have quite a catalog for someone that has only been here about six months. What motivates you to create such an impressive list of tunes? It’s totally a mood-driven characteristic to be able to create, and (one can hope) each composition that I create has it’s own character and flavor each relative to the particular mood I was in when I started working on that particular song. In layman’s terms: It’s how I feel at the time. My inspirations range from the weather, the time of day, that little insurance lizard, our pets, life-cycle events, etc. You say your music is your therapy. How? For example: Hear the Inner Child Cry was composed after finding out that my buddy in NC was in the hospital in critical condition w/ meningitis, so, by my standards, it has a moody, fearful, yet hopeful sound to it, but, within the hope there was still tears…Music is how I can channel any emotional energy I have…laughter, tears, anger, etc….It sure beats the hell out of beating the hell out of someone or screaming or crying like a babbling baby. You’re primarily a guitar player but your songs tend to show an understanding of other instruments as well. How did you learn to use them effectively in your pieces? I am kind of self taught in something they called in college “Keyboard Improvisation” so everything (that’s not real guitar or midi drum-loops) in my songs is created sitting at my midi keyboard instrument (cheap Radio Shack keyboard with a midi interface). Also it’s a matter of trial and error. 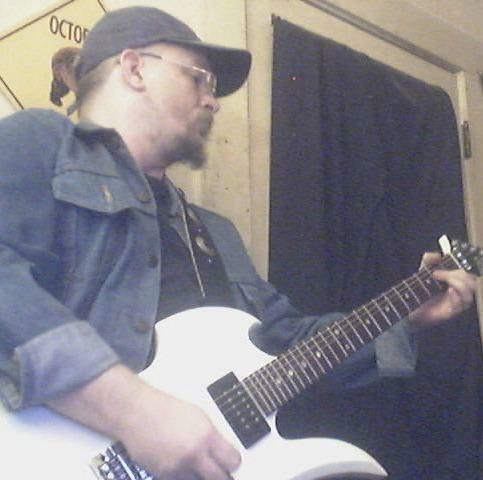 First and foremost, I play guitar, and by no means am I a vocalist, so I have to use my guitar as a vocal instrument and make it sing (a la Eric Johnson or post-Starship Craig Chaquico). So, everything else is a stew of sorts, a dash of piano/keyboards, a heaping tablespoon of drums and a sprinkle of bass guitar, season to taste. I am guilty as the next person of creating something (“Adventures in Stereo”) that is nothing but a loud wall of sound, but most of the time it’s like the guitar takes center stage and everything else fills in the blanks and falls into place, setting the overall tone of the composition (read: sound bed). What hints and tips can you give to other guitar players? CHUCKLES…moi? Advice? Grab your ax and go! If you know (or have even the slightest understanding of) scales, start improvising, write down what you are doing, it really isn’t rocket science. Music theorists hate me because my answer is “if it sounds good, play that chord progression or melody”. Also, don’t be afraid of a little overdrive or distortion…mind you, I said a LITTLE!! Treat it like you would a fresh cooked vegetable…warm and crunchy good, flat and mushy, bad!!! Do you have a favorite guitar manufacturer and model? Why? Carvin and BC Rich…it’s all about comfort…the Carvin guitars are smaller in scale to say a Fender Strat or Gibson Les Paul or SG, as well as being lighter in weight due to the use of alder or poplar instead of rock maple. BC Rich guitars with their wild designs first caught my eye when I was watching MTV and saw Craig Chaquico and Paul Kantner of Jefferson Starship playing them and fell in love w/ the Mockingbird…they also are much lighter than a Les Paul or Strat. 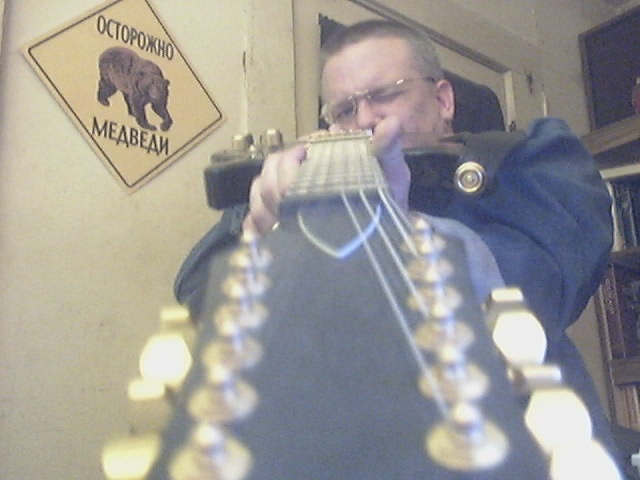 And I am spoiled by both manufacturers as they both have 24 frets (a 2 octave range on each string). Do you get the most enjoyment out of composing, playing, or performing? And why? Where do you plan to go with your music? What are your aspirations? Someday I would like to be in a band again and get up on stage. Right now my biggest high in music is having someone say “I like that” and I am OK with that. I have released one CD which I recorded via Garage Band, which I self-promote/market as well as distribute. It was fun putting it together so I am working on another set of compositions that will be on a subsequent compilation CD. To get your guitar sound do you record direct into DAW software or do you mic up an amp? Plug the guitar directly into the audio input on my eMac and let Garage Band pre-amp it, all the effects are done within the computer. How do you come up with a song? Do you hear pieces of it in your head at first or work it out on the instrument? CURSED CURSED voices in my head….I get a melody in my head and it must come out…kind of like how you feel an hour or so after eating Mexican food, eh? Seriously, when I get a melody or chord progression in my head, I immediately have to write it down… now how easy is that for someone who loathes sheet music? So if I am on my computer at work at that precise moment, I’ll fire up Garage Band and use keyboard typing to record the melody or chord progression. 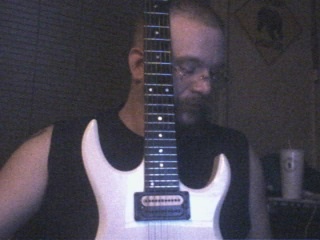 4: NOW I’ll start writing stuff down, chord changes in verses, choruses, etc. 7: Should the piece warrant keyboards, then add them via midi keyboard (not loops but actual playing on an analog device fed into a midi interface using various piano/keyboard/organ settings)…Sometimes the occasional string section or choir cram themselves in my 12 x 12 space…how about cramming the Grand Olde Opry in my studio? Sure, what the hell! 8: Now, lets see how this all sounds, time to go into post production, sound levels, panning, various effects, reverb, echo, EQ, blah blah blah. 9: And if Garage Band and iTunes are playing nice with each other and with me, what I will get when I mix down the song for iTunes sounds pretty much how it sounded in Garage Band and we’re golden, if not, then it’s BACK to Garage Band to make some adjustments. I have found the most fickle tracks to work with at this point are percussion…they may sound low in volume in Garage Band, but get them into iTunes and they sound like an earthquake. Your emails often end with “Just remember, it was an amateur that built the Ark and professionals that built the Titanic”. Do you apply this somehow in your life and do you have other sayings that help to get you through the day? Do you have any tips or hints that you would share about music making, guitar etc for other MacJammers? Like I was taught in art school, when you’re brainstorming for ideas, always give any of your ideas (as bad as they may look/sound) creedence, for you never know, the worst idea you may think you have, may turn out to be the best thing you’ve ever created. Don’t be afraid to experiment…like using a screwdriver for a slide, or tucking a handkerchief under the strings at a bridge to give a more plunky sound. How did you find MacJams and how has your experience been here? A friend of mine in Pittsburgh told my partner about it, I put it all aside for a couple months before I had a day in which I had time I could devote to registering, wandering in, taking my seat and joining the MJ family. What is the one thing you would like to see changed on MacJams and why? I really think a notification box for each user showing what they are currently listening to in iTunes would be cool (OK, Simon, breathe, breathe). Other than that, I think Simon and Miguel are doing a really good job at helping us w/ our craft. Do you think digital music and the internet have helped your musical creativity? And, I can market and sell my CDs from the internet, from our website now, and soon (when money isn’t so tight here) I will be selling my music on iTunes. From your current catalog of music please give me three songs that best represent Eddie Fliess. and anyone who has done anything that davisamerica, outtaorbit and MarkHolbrook get their hands on! Click the links above to go to their artist pages. If you don’t play an instrument, pick up one and try…and who cares if it sounds like -expletive-, you’ll never know what that sound could turn into. all the fun …thank you so very much for sharing !!!! He plays guitar, bass, keys, he composes, he does so with aplomb (and apricots.) And he’s a great guy! Definitely a good Macjammer to know and listen to! Nice one Eddie and Mark, thanks. Great to see this idea still continuing a fine read indeed! The community spirit does grow from getting to know each other a bit better. Keep ’em coming- off to do some more ‘adventures in stereo’ heheheh. It’s good to get to know you, Eddie! Thought you were cool before … this just confirms it. Eddie you rock man! Great interview. Thanks for being a part of MJ.